With winter and the holiday season just around the corner, it’s time to start preparing for the snow and icy weather that comes with it. For your family, part of this preparation may be to review some essential winter driving safety tips, especially if you have a newly licensed driver in your home. In this three-part blog series, we will point out some important winter driving safety tips that can keep you and your family safe on the roads this winter season. If you do end up being involved in any type of motor vehicle accident this winter, however, don’t hesitate to contact the Littleton car accident lawyers at Bahr and Kreidle for superior legal representation and help getting the compensation you likely deserve. As you prepare for the winter season, here are some essential winter driving safety tips to review in order to keep you and your family safe on the roads this winter. Never warm up your vehicle in a closed-off area like an enclosed garage. Check your vehicle’s tires to ensure they are properly inflated. You may want to get in the habit of doing this every morning before driving or even once a week to ensure your tires are inflated sufficiently and are in optimal condition. Do your best to keep your gas tank at least halfway full throughout the winter season. This can help you avoid gas line freeze-ups. Never use cruise control if you are driving on roadways that may be icy, snowy, wet or otherwise slippery. 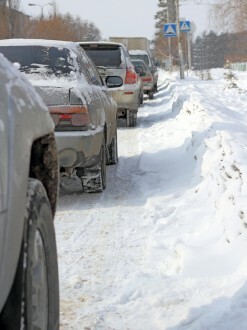 Do your best to limit – if not fully avoid – the use of a parking break during freezing, snowy and/or rainy conditions. As you steer on icy, snowy and slippery roads, always look and steer in the direction in which you intend to travel. Always wear your seatbelt and strongly urge your passengers to wear their seatbelts every time you (and they) ride in vehicles. We will resume this discussion of helpful winter driving safety tips in a few upcoming parts of this blog series – we encourage you to check them out! Have or someone you love been injured in any type of motor vehicle accident? If so, it’s time to contact the Littleton car accident attorneys at Bahr and Kreidle. Since 1983, our trusted and dedicated lawyers have been fighting on behalf of injured people and aggressively standing up against injustice, inequality and intolerance. Our lawyers know how serious and devastating the impacts of car accidents can be, and we know that many injured people depend on settlements to get the medical treatments they need. That’s why we are committed to being here to advocate injured people’s rights, help them hold negligent parties responsible and ultimately get them the highest possible awards for their injuries and losses. You can get more information about your potential case and rights by meeting with us for a free, no obligations initial consultation. To set up a meeting, call us at (303) 794-7422 or email us using the form on this page.